Purchased 1915 from the artist by Nathan J. Miller for his wife, Linda R. Miller, New York; by inheritance 1936 to her daughter, Helen Miller Davis, New York, until at least 1959; her daughter, Natalie Davis Spingarn; gift 1990 to NGA. She lent the painting to exhibitions in 1956 and 1959. Exhibition of Paintings and Drawings by Max Weber, The Print Gallery, New York, February 1915, no. 21. [Max Weber], Jones Galleries, Baltimore, 1915. 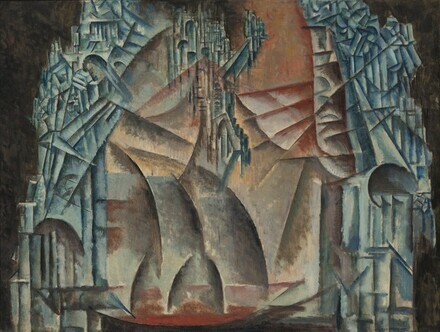 [Max Weber], Montross Gallery, New York, 1915. An Exhibition of Oil and Tempera Paintings, Gouaches, Pastels, Woodcuts, Lithographs and Drawings by Max Weber, Celebrating the artist's 75th birthday, The Jewish Museum, New York, 1956, no. 5a, as Fourth Dimension Interior. Max Weber: Retrospective Exhibition, The Newark Museum, 1959, no. 16, repro. Max Weber: The Cubist Decade, 1910-1920, travelling exh. organized by the High Museum of Art, Atlanta, 6 venues, 1991-1993, no. 37, repro. (shown only at first three venues: High Museum of Art; Museum of Fine Arts, Houston; Corcoran Gallery of Art). Max Weber's Modern Vision: Selections from the National Gallery of Art and Related Collections, National Gallery of Art, Washington, D.C., 2000, brochure, fig. 3. Inheriting Cubism: The Impact of Cubism on American Art, 1900-1936, Hollis Taggart Galleries, New York, 2001-2002, pl. 39. American Artists from the Russian Empire, Fred Jones Jr. Museum of Art, The University of Oklahoma, Norman; The State Russian Museum, St. Petersburg; State Tretiakov Gallery, Moscow; San Diego Museum of Art, 2008-2010, no. 1, repro. North, Percy. Max Webber, American Modern. Exh. cat. the Jewish Museum, New York, and three other venues. New York, 1982; 57-58, fig. 31. Henderson, Linda Dalrymple. The Fourth Dimension and Non-Euclidian Geometry in Modern Art. Princeton, 1983: 176, fig. 53. Ricciotti, Dominic. “The Revolution in Urban Transport: Max Weber and Italian Futurism.” American Art Journal 16 (1984): 50. North, Percy, and Susan Krane. Max Weber: The Cubist Decade, 1910-1920. Exh. cat. High Museum of Art, Atlanta, and five additional venues, 1991-1992. Atlanta and Seattle, 1991: 34, 42, 56, color pl. 37.